The 12th International Aviation and Space Expo is taking place in the Russian city of Zhukovsky from August 25 to 30. A full-scale model of the fifth generation stealth fighter, the MiG 1.44 MFI, will be displayed at the exhibition. This aircraft lost out after implementation of the PAK FA program, but interest in this aircraft and its dramatic fate has not declined. The MiG 1.44, to be on display soon to visitors at MAKS, is unique in that it has never been shown to anyone except journalists, who witnessed a brief demonstration in 1999. The aircraft did not fly then, but did a short run on the tarmac. Designed by the Mikoyan Design Bureau, the multi-function frontal fighter, as the new aircraft has been defined, will include such capabilities as cruise control at ultra-sonic speeds, high maneuverability, reduced radio and thermal signatures, short take-off and landing, use of latest advances in computer technology for airborne radar equipment, applying new systems controls and much more. These innovations would not increase, but actually decrease expenses on aircraft maintenance both in the air and on land. 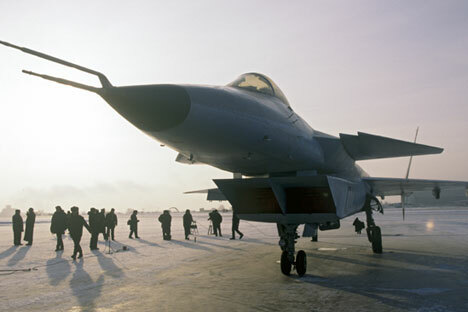 Because the Mikoyan Design Bureau started the conceptual design and mock-up of the aircraft in 1991, the new aircraft’s future was compromised. Going through the period of complete deficit of the 1990s, during which the Mikoyan Design Bureau was restructured, becoming RSK MiG and being merged with the Sukhoi Construction Bureau, the MiG 1.44 multifunctional frontal fighter (MFI) took to the air only once, on 29 February 2000. The test pilot, Russian hero Vladimir Gorbunov, is the only pilot to have flown the MFI. He described the aircraft as having high potential. However, time had been lost. Seen at that time as competition for the American fighter, the Lockheed/Boeing F-22 Raptor, the MiG 1.44 MFI gave way to a new project, the PAK FA, which began in 2002. The only flying model of the MiG 1.44 was left out in the open at the Gromov Flight Research Institute in Zhukovsky city. It was kept in a hanger for maintenance in 2013, and will be shown as part of the upcoming aviation salon МАКС-2015. This superb aircraft, using a canard design with vector control engines, has not disappeared into history without leaving its mark, but has become the subject of discussion relating to scandalous stories of possible technology transfer for a Chinese MFI design. A number of experts adhere to their opinion that technological improvements of the MiG 1.44 have been used in developing the fifth generation Chinese fighter, the Chengdu J-20. A journalist with the Reutersnews agency revealed this information in August 2011, based on information provided by an anonymous source. Refuting the speculation, on 25 August 2011, RSK MiG spokesperson E. Fedorova told a RIA Novosti journalist that “Russia never has provided, does not provide and will not provide components and assemblies to China to develop the fifth generation Chengdu J-20 Black Eagle”. However, some experts continue to persevere with claims of a possible sale of technology and plans of the MiG 1.46 to China. The MiG 1.46 was the improved version of the MiG 1.44. Independent analyst Adil Mukashev, a specialist in Sino-Russian relation, suggests that there was a commercial agreement. “The Chinese acquired plans for separate components of the Mikoyan”, he said in ‘Bastion’, an industry publication. Whatever the truth is, the MFI 1.44 will be seen for the first time by the general public in 2015.This means that the previously top secret aircraft has now ceased to be classified and has finally lost the chance of being manufactured in Russia.